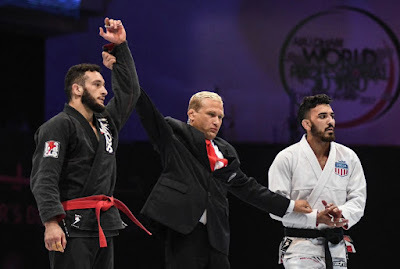 After twelve days at the Mubadala Arena in Zayed Sports City, the 2018 Abu Dhabi World Professional Jiu-Jitsu Championship came to a close. The seven male black belt finals went down in front of a crowd of the passionate UAE fans. $15,000 was on the line and some of the top athletes in our sport were in action. The black belt level was still dominated by Brazilians, with a "Brasileiro" taking home the gold in ten out of twelve weight classes. Typically, the Americans have been the next level of competition, but the performances by a pair of Europeans in the finals show the worldwide scope that jiu -jitsu has taken on. The 77 kg male final was the only final to not contain a Brazilian, with Canadian Jake Mackenzie and Norwegian Espen Mathiesen fighting through a huge bracket to make the final. First-year black belt Mathiesen took the win with a reverse armlock from a triangle.